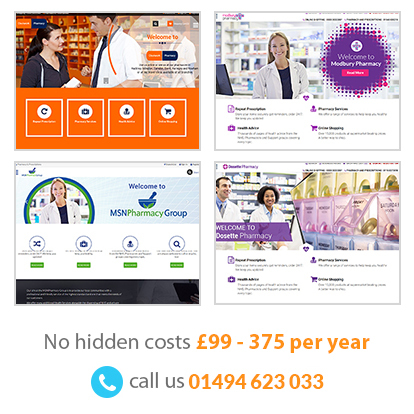 The lowest cost, most advanced pharmacy website available anywhere! Add-ons available for Email Hosting and Seo. We know you won't want to go anywhere else so no multi year contracts! Free .co.uk domain name (if you don’t already have one) hosting. Comprehensive MedicineChest health information leaflets uniquely written to drive the role of pharmacy- No other provider offers this. Also Includes all NHS choices health information. There is no need for your customers to go anywhere else! The health information is proven to increase sales and support your expert, in-store advice Your health information is constantly checked and updated by us. Responsibility rests with The Pharmacy Centre. We provide with what is known as a white label service Your online shop is open 24 hours a day. Offers Thousands of products including many specialty items not stocked even in largest high street stores. No need for you to do fulfilment – it is all done for you. Most online shoppers buy on price. Your e-commerce solution offers market leading prices – every item discounted. You beat supermarkets, Boots and Superdrug etc on price. All registered customer data is yours. Risk free, all profit. Leaves you free to concentrate on marketing your customers whilst keeping ownership of their sales data. As you own the customers, you can, of course, at any time decide to offer e-commerce yourself so the beauty of our service is you can build sales and prove the model before investing time and money. Our policies have been checked by Charles Russell and corporate governance lawyers at our major clients WE WILL NEVER PASS ON YOU OR YOUR CUSTOMERS’ PERSONALLY IDENTIFIABLE INFORMATION TO ANYONE. WE WILL NOT NEEDLESSLY CLOG UP YOU OR YOUR CUSTOMERS’ INBOX WITH COMMERCIAL SPAM. YOU AND YOUR CUSTOMERS MAY DELETE/CHANGE YOUR INFORMATION AT ANY TIME. YOUR CUSTOMERS MAY OPT OUT OF RECEIVING ANY EMAILS FROM YOU OR US AT ANY TIME. Medicine Chest takes you and your customers’ privacy and data protection very seriously. Every effort has been made to make sure our databases are secure can only be accessed by the you and trusted Medicine Chest staff and occasionally, trusted third parties such as Doctors, Medical writers and IT personnel for the purpose of improving this site. All confidential or private customer data is encrypted using 2048-bit next generation universally compatible Global Sign SSL certificates as used by companies and organisations such as Novartis, NHS, BBC , Vodafone. Data is backed up nightly in multiple locations for security. In addition, all repeat prescription orders and patient consent nomination forms are also sent to you via email for additional back up. Free online repeat prescription ordering.